Glory to Jesus Christ who empowered Saint Demetrios parish and made it possible for us one more time this year to organize the “Christmas Day Dinner”, and host our neighbors and the lonely people within our city. Helping hands were plentiful; as a group of about 40 people came together to support this event including a lot of children. Thank you to the helpers, supporters, and donors that saw the benefit of this event. Thank you to God, the born baby in the manger that inspired such love in the hearts of many, and brought others to enjoy receiving this love. The Christmas Play was a wonderful event on Sunday December 23rd. Almost every parishioner from Saint Demetrios had an opportunity to take a supportive role to make it happen. As you know, the work was not over when the stage curtain was closed, more work was still needed afterward to store away the robes and dresses safely for next year. This is a glimpse of the backroom of the stage during the time of the after play organization. Your donations are always welcomed to replenish dresses and obtain new and needed items. Should you become inspired to help with the work afterward, please let the “Christmas Play Team” know your desire. Thanks to the efforts of Andrew Anthony and other volunteers and parents it became possible to organize a small winter camp of the younger age of children that are in the elementary age of “JOY” and “HOPE” after Christmas on December 26 & 27. This first time experience was successful and made it possible to test the concept. Glory to God the fountain of all good things, and for making it possible for his love to be shown to the world through the ministries of Saint Demetrios parish. very delightful event. Glory to God for his mercy and compassion, all the needed details and logistics had come together in a nicely harmonious and pleasing way to all. The generous offering of the luncheon & catering cost, the donations of the silent auction baskets, setting up, decorating, sale of tickets, cleaning and the cheerful service attitude made this day happy and joyous uniting all together for the support of the many worthy causes of the Philoptochos mission. It is a complex process to measure church communities effectiveness and get an accurate reading about the general spiritual health of a certain parish. However, the level of hospitality and eloquence of particular church community events is usually a good manifestation of its character, and depth of commitment to God. According to this criterion, and taking into consideration the level witnessed at Saint Barbara’s luncheon as well as other similar events, the level of joy, peace, hospitality, and generosity become a revealing factor of your love to God, and show the degree of your willingness to sacrifice for God’s sake. Thank you for being an example of a good obedient servant of God and for heeding the word of God by going the extra mile when asked or prompted by the soft voice of the Holy Spirit. Faithfulness to God is shown mostly by doing the small things. Those who are not ready to be faithful while doing small tasks or willing to be generous through small sacrificial giving are not going to be faithful or daring to serve God loyally when it comes to facing large and complex situations. “Sing to the Lord a new song; sing to the Lord, all the earth. Sing to the Lord, praise his name; proclaim his salvation day after day.” (Psalm 96:1-2) The children led by their advisers and chaperons on Sunday December 16th experienced firsthand and from an early age the meaning of Christian service and attitude during the Christmas caroling day. Through this event, children had the opportunity to visit nursing homes, shut-ins, and see other parishioners’ generosity and love. Each family had a different creative and lovely way to express love and appreciation toward their little guests. Christmas caroling day in the life of a youngster is more than singing a few Christmas songs; it is rather an opportunity to accumulate fond memories of imitating other parishioners on their walk toward Christ and to learn valuable lessons from the parish role models. Thanks are due to all the families who made Christmas caroling a special day either by being part of the Christmas Caroling team or by inviting the team to sing at your place. This year’s Vasilopita Celebration will held on Sunday, January 6, 2019, at our Community Center following Liturgy. If you are able to offer a small portion of your time for this event, please call this year’s co-chairmen to offer your help. All proceeds from the Vasilopita Celebration will be forwarded to Saint Basil’s Academy in New York. Please plan to be in attendance on that day for this celebration. You may be the fortunate individual who received the gold coin or the Saint Basil’s coin! We thank you for your support in the past years and wish you a healthy, happy, and safe New Year! Epiphany service picnic and diving for the cross DeLeon Springs Saturday, January 5, 2019. Bring fond and sweet memories of the past back! Celebrate with St Demetrios. Service begins at 10:30 am under the pavilion, followed by procession and diving of the cross! Park entrance fee $6 per car (up to 8 passengers) – please carpool! Lunch provided. Enjoy delicious barbecue. Please RSVP by Thursday, January 3rd to church office (386) 566-2886. Don’t forget to bring your own folding chairs. Should you want either to help in serving, cooking, or donating toward this cause, please contact the church office 386-252-6012. We do have new costumes and things that have come, so I really need to know if your child will be here for the play. I must start assigning parts! We will have a mandatory (drop off so you can shop, go to dinner, or just RELAX!) practice on Saturday, December 22, like we’ve always done, and the play itself will be the next day, Sunday, after church December 23! Please please let me know if your child(ren) will be attending! Somewhere in this schedule I will be popping up a Christmas movie night at the church with hot chocolate and treats! I’ll let you know a date soon! If you desire to invite the Christmas Angels Choir of the St. Demetrios to make an appearance at your door to sing the good tidings on Dec 16th, Contact: Voula Koulouris 386-852-7475 or the church office 386-252-6012. Everyone’s invited to this year’s Christmas celebration by AHEPA and the Daughters of Penelope that will be held on Saturday, December 15th at Dine & Cruise (www.dineandcruise.com). Please meet at the dock at Halifax Harbor Marina 125 Basin St. in Daytona Beach at 12:30. 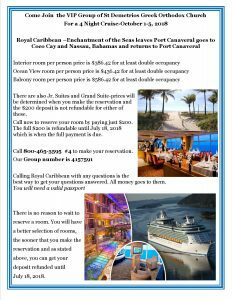 $30/per person, including taxes and fees. The two hour dinner cruise starts at 1:30 pm. It is important to show up on time so we can all sit together. Philoptochos Christmas food drive has started. Philoptochos & Sunday school are partnering for the food drive. There are 2 marked decorated baskets in the narthex. Food will benefit local school children in need. Last day for donations is Dec. 16th. Philoptochos has a Christmas “angel of hope” tree decorated by GOYANS. Philoptochos has partnered with the GOYANS. All Gifts benefit local school children in need. Please see the insert today for further information on Gift Boxes for Soldiers and Veterans. Now accepting new and gently used jackets, coats and pullovers for our annual One Warm Coat drive. The First Monastery Vasilopita baking day is Tuesday November 13 beginning at 8:30am and continues all day. Please RSVP to Raven Kastis rkastis4@gmail.com by November 11th. We are starting our Thanksgiving food for School children in need drive until– Today November 11th The numbers have doubled this year in some schools. Our goal is to provide the families with a Thanksgiving meal and the children with snacks during the break. Baskets will be in the narthex. The Saint Barbara’s Philoptochos Ladies want to thank all of the donors that made it possible for the Panama City Relief Drive to be successful. Gary Yeomans Daytona Ford Lincoln Dealership generously provided the large truck needed to transport the donated items. Joe Daprile from American Foundation for Disabled Children, INC donated generously many of the needed relief items. These and all the other collections that the parishioners of Saint Demetrios and their friends donated were transported through the gracious effort of Dr. Michael Psikogios who drove the truck last Saturday all the way there and back to Panama City to deliver them to St. John the Theologian Greek Orthodox Parish. “O Lord, our God, crown them with glory and honor” Saint Demetrios parish has hosted another successful premarital seminar for a group of future couples who are preparing to be married and establish their own future Orthodox Christian families. This premarital course is part of the Family Life Ministry of the Atlanta Metropolis, and aims to keep family life healthy and joyful. The health of a Christian family is a matter of art, and knowledge as much as it’s a matter of dedication and prayer. Please check out the available resources for everyone in the family through the Fami-ly Life Ministry Page of the Greek Orthodox Metropolis of Atlanta and keep your family life healthy and strong (http://www.familylifeministry.atlanta.goarch.org/). “Let the little children come to me, and do not hinder them, for the kingdom of God belongs to such as these” (Mark 10:14) Saint Demetrios parish has been tremendously blessed the last few years with many little ones that are frequently being bap-tized. They are growing up quickly making the youngsters min-istries lively. Seeing them in the pews and hearing their voices bring great joy to all of us. May God grant strength to parents, grandparents, and all the volunteers in the service of upbringing the little children. Congratulations to Petros and Jennifer Kaniaris, their children, Nona Demetra, and their extended family on the baptism of their little daughter Evgenia Anne on Satur-day; October 13th, 2018. Glory to our great God Jesus Christ and abundant thanksgiving for the birth of Emmanuella (Emma) Elizabeth on the evening of October 24th, 2018. Congratulations to her parents Gianni and Maria Psilopoulos. Also congratulations to grandparents Stacy and Soula Augustine, and all relative locally and faraway. The birth of Emma is a gift to Saint Demetrios parish as well which has been blessed one more time this year with this priceless divine gift from God. The Forty days blessing will happen in December. The St. Demetrios Community is invited! If you care about the well being of your heart, you are invited to attend a presentation from one of the top cardiologists at Florida Hospital. Learn about the latest advancements in cardiology and heart wellness. The Daughters of Penelope are asking our church community for new clothing donations for the Penelope House, a Domestic Violence Shelter located in Mobile, Alabama. They are requesting New Pajamas and Socks (all sizes) for Women and Children. Please drop off your donation in the Penelope House Basket in the Narthex. Deadline for Donations – May 13th. Saint Demetrios GOYA Would like to invite the Community to attend our Annual Saint Demetrios Mother’s Day Luncheon on Sunday May 13th, 2018. Tickets will be available in the Church Hall after the Divine Liturgy. Cost per ticket is $10.00 and we will be serving a special meal prepared in our own kitchen, as well as sides and a drink. Please help support our GOYA Ministry. On Saturday May 26th from 6:00 pm to 8:30 pm, join the Masters of Games for a night of fun activities with your Saint Demetrios family. There will be a Spaghetti Dinner served by our GOYA families, a short 15-minute keynote address and games for all ages. The cost is free and it’s the place to be. So, be there or be square, as in, you won’t be around. So be around, play a round and get down with the Masters of the Game. “The AHEPA Speedway Chapter 410 is accepting applicants for this year’s scholarship awards. The deadline for application is April 30th . Applications can be downloaded from the website at www.ahepa410.org or picked up from the church office. If you know a student who can benefit from a scholarship, please encourage them to apply”. The Scholarship luncheon is Sunday May 20th. A fervent thank you is owed to our great God for showering upon us his abundant grace during this Paschal season. Thank you to all the parents for their efforts in teaching their children that church life and services should be a priority in their lives. Holy week season that starts on Saturday of Lazarus is an intense time of church services and events. It would require parishioners to dedicate considerable effort and time for carrying out all the needed tasks. Even when some parishioners could not be present at all the services; they still had to dedicate considerable time as part of other much needed preparations or activities from decoration, to cooking, baking, cleaning, setting up for special events, shopping or obtaining necessary materials, or lining up people for various tasks. Thank you to all for carrying out whatever task you had under your watch, and for dedicating for it the necessary time, effort and attention. Without the conscious effort of each and every one of you through the grace of God, we would not have enjoyed such a special time. Thank you as well to all of the donors who provided for all the extra needs of holy week that beautified the church and community hall. During this Great Lent season period, your Philoptochos of Saint Barbara would like encourage you to do extra random acts of kindness above and beyond what you are doing now or outside of lent. Please take the time to write a thank you to the men and women in uniform or serving to protect our country. Philoptochos has thank you cards next to a box in the social hall to drop the letters in and they will be shipped to active duty servicemen. 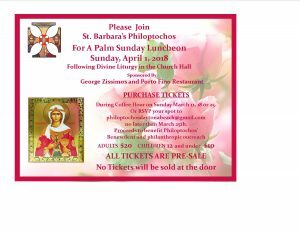 Exclusive of Palm Sunday luncheon and Pascha Sunday, four consecutive Sunday coffee hours are open for sponsorship. Please help filling these empty spots by calling the church office and volunteering your efforts or share it with another family of your choice. The coffee hour is a wonderful opportunity for parishioners to meet and greet after the Sunday Divine Liturgy. This is how we are able to host our guests, offer them hospitality, and make them feel welcomed. It is impractical to invite all parishioners to your home; hosting the coffee hour fellowship gives each family the opportunity to welcome parishioners at the church instead, while creating same cordial family environment. Part of the new set of red altar boys robes is estimated to be ready by holy Friday April 6th, 2018. It is envisioned that all the altar boys will wear the new robes for uniformity during the annual pictures of myrrh bearers’ girls and altar boys pictures. The rest of the set will be completed at a later date. For now only enough robes will be ready for the service of holy Friday April 6th, 2018. It is very important to inform Tasso Kiriakes if you are going to be attending the holy Friday evening Epitaphio service and Pascha midnight service on Saturday April 7th, 2018.
team, please contact Tasso so he can determine if they would be ready to join the holy Friday service team. Another happy moment at St. Demetrios through the 40 days blessing of Demi Koulouris the sister of Alexia and daughter of Nick and Angela. Glory be to God for enriching Saint Demetrios with many children and for entrusting to our hands the care of these precious divine gifts. Saint Demetrios Goya had a very successful sleepover at the church last week. Goyans came to church service early in the morning after long night of various activities, stayed thorough the general assembly, observed the meeting, participated, and left energized and happy despite ruffing it up, and lack of sleep. Thank you Andrew Anthony for organizing this event, parents, and the college students volunteers whose presence was much needed,their aid was invaluable, and very much appreciated. about the different aspects and activities of St. Demetrios parish. Thank you to the parish council and ministries for making this meeting a happy and inspiring family event for the entire body of St. Demetrios parishioners. Please take any initiatives you think would be practical or proper. These acts can be small and simple- such as opening a door for someone or return yours & someone else’s grocery cart from the Parking lot, write letters to soldiers, buying a coffee for the person behind you. contribution of several donors towards the same item is encouraged. The surplus of donations toward some of the popular items will offset the deficit in obtaining other less popular items, or items that are needed but not on the “Pascha Wish List”. Thank you Denise Brown for a wonderful presentation about St. Stephen summer camp. Please consider sponsoring a camper who has never attended or who is financially unable to attend. Our St Stephen’s Summer Camp has a rich tradition, dating back to the 1980’s, and is grounded on the principals of living a true Orthodox lifestyle with twice daily liturgical services, opportunities for reflection, community living and meals, athletics, arts & crafts, and nightly social activities. The cost of attendance for 1 camper is $400 (excluding transportation). Our hope is to have enough sponsorship to send all the children who wish to attend. It is an incredible lifetime experience. St. Demetrios Campers will be attending Week #5 July 22-July 28, 2018.
elementary, junior, and high school wrote and delivered their speeches. 2:00 p.m.: St. Photios Foundation Annual Meeting convenes at the Casa Monica Hotel. 5:30 p.m.: His Eminence, Metropolitan Alexios of Atlanta will celebrate Great Vespers in St. Photios Chapel. and co-founder/owner of Spectrum films, Nicholas J. Furris will emcee the event. Television news correspondent Michael Emanuel and AHEPA Supreme President Carl Hollister will be the speakers. Theofanis Kitsiklis at HOLY TRINITY, 2940 CR 214, St. Augustine, FL 32084. Matins begin at 8:30. 1:00 p.m.: The St. Photios Feast Day Banquet will begin at the Casa Monica Hotel. Archon Nick Furris will emcee the event with Michael Emanuel. Dr. Elizabeth Prodromou, professor in the Program in International Negotiation and Conflict Resolution at the Fletcher School of Diplomacy at Tufts University, will give the keynote address. Last weekend was a wonderful blessing for the entire parish family of Saint Demetrios community. On Saturday the outdoor Divine Liturgy to celebrate the baptism of our Lord and God Jesus in the Jordan River by the hands of Saint John the Baptist took place in Ponce DeLeon Springs. The Divine Liturgy through the effort of a very dedicated team went very well; the diving for the cross was a blissful event; and the barbecue afterwards turned out to be a nice celebration.